Love is blind, but divorce is expensive -- starting with attorney's fees. In a divorce case, even the judge can bill you. 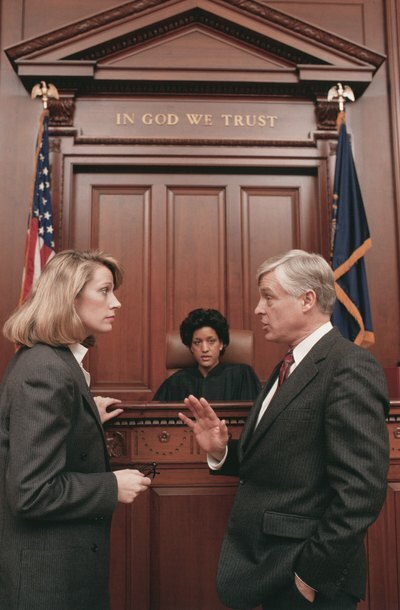 A court can charge fees to one of the spouses, for example, for filing a frivolous motion. That spouse would then be responsible for paying the attorney's fees incurred by the other spouse. If a court orders you to pay attorney's fees, you may object to the order or file an appeal. State laws on divorce may require that each side have access to adequate representation. California statutes, for example, provide that if there is a wide discrepancy in assets and income, one party may file a motion to have the other party pay his attorney's fees. If the court awards attorney's fees, either party to the case may then make an oral or written motion to modify the amount, or a motion to have the court allocate the fees according to the complexity of the case and the costs borne by either party. The court can also order the payment of attorney's fees as part of a sanction or penalty. A party that files a frivolous motion, for example, may force the other party to hire an attorney to defend the matter by gathering documents, taking depositions, and appearing in court. If one spouse demands that the court reduce the other spouse's visitation time, for example, but has no grounds or evidence for doing so, the court may penalize the spouse for filing a frivolous motion. The court cannot only deny the motion but also order the payment of attorney's fees as compensation. Each party's ability to pay the fees is not a factor under these circumstances. One party or the other may also file a motion for attorney's fees as well as costs. Such a motion would have to state the legal basis of the claim, and itemize the charges -- usually in the form of a time billing statement and a breakdown of costs. The petitioner, in this case, must serve the motion on the respondent, and the court will schedule a hearing. Depending on the laws of the state, the court may consider each side's financial condition and ability to pay their own fees, the attorney's results in the case, and the effect payment of the fee would have on the standard of living of the payer. The court decision on attorney's fees will likely take the form of an order, which the respondent may appeal. A spouse who objects to paying fees by court order must provide grounds; he may charge that the fee is excessive, for example, or that costs are incorrect, or that billing statements do not accurately reflect the actual work performed by the attorney. An objection may claim that the court applied state law incorrectly to the facts of the case, or that attorney fees should be partially allocated to the other party. Any objection must be filed timely; state law or local court rules will set a deadline for either party to object to or file an appeal of any court order. Gregory S. Forman: How Does the Family Court Decide Whether to Award Attorney’s Fees? It may be time for a divorce if you catch your spouse stealing money, but a court cannot grant your divorce unless you meet specific legal requirements. These requirements vary by state. Generally, you can divorce your spouse if you simply do not get along anymore, even if the reason is based on his theft. Who Pays the Court Costs for a Modification of a Custody Order?